It's also a thought that could change the world …. Karma – you get back what you pay out – seems to be the basis on which the world and our lives operate. Grace – the biblical notion of undeserved merit or favour – seemingly stands in stark contrast to the way in which we think of our world, ourselves and the God who stands behind and over it all. And yet – if we are honest about ourselves and others – grace is what we all wish for. Grace is what we all desperately need. Grace – is at the centre of our understanding of Jesus – his person and work. Grace is at the heart of the Christian life. And yet grace – is what so many of us fail to comprehend, what so many of us quickly forget and move away from. That's why this short book is so good. 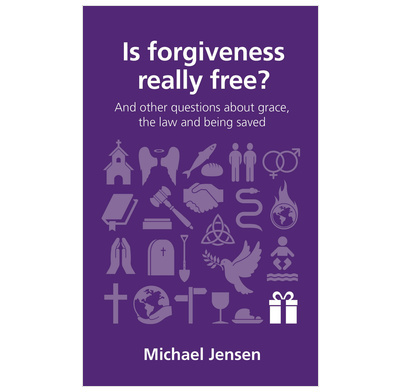 By addressing the question “Is forgiveness really free?” the author takes us to the very heart of the gospel – the news it proclaims and its significance for us all. If grace is free, is it worth anything? Why does God give grace to some and not to others? What place does the Old Testament Law have in the life of grace? How does grace change me? How bad are human beings really? One of the great things about this book – is that at under eighty pages no chapter is more than ten pages long – meaning no chapter would take more than 10mins to read. In one sitting this book could be read in under two hours (as I did) – or a chapter a day would see it easily done in under two weeks. I think this book fits the category of a short step for a long gain. Bible-centred churches talk about grace a lot. And, if you're anything like me, you sit and nod when you hear the preacher talking about Jesus' forgiveness made possible on the cross. But living out grace day to day...? That's a different matter! This little book takes a look at what grace really is, but it's far more than just an overview of an important doctrine, it's a heart-warming reminder of just how amazing forgiveness truly is. In every page, clearly articulated biblical truth will fuel your mind and sensitively thought-through application will lighten your heart. It's a great reminder of what God has done and how truly wonderful it is to escape the ungrace (the "no such thing as a free lunch" philosophy) of the world and revel in true grace from our generous heavenly Father. The section on the relationship between law and grace is really helpful and accessible... and the reminder that grace impacts us on a deeply personal level and provides the context for true and lasting change? Well, that just brought a smile to my face! If you're confused by grace - this book is for you. If you understand it but haven't let it impact you at the centre of your heart - this book is for you even more!